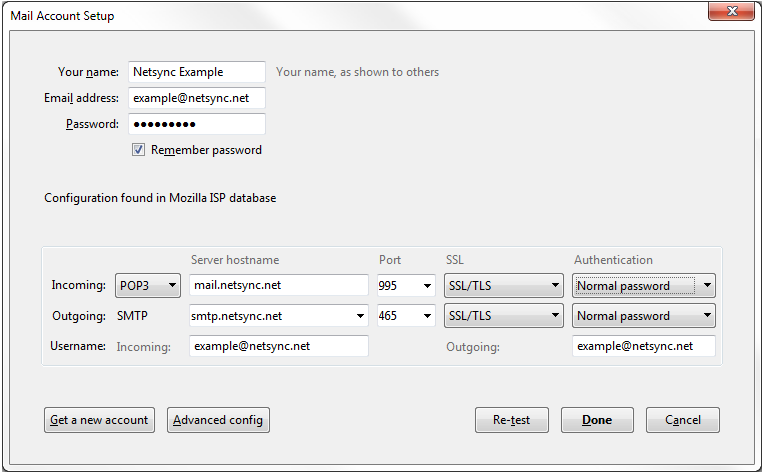 Welcome to the DFT Communications and Netsync IT Services Support page. Here you will find many tutorials and guides that can help you. Please feel free to utilize all the resources that are available here. If you don’t find the answer you are looking for, please contact tech support and we will do our best to help. 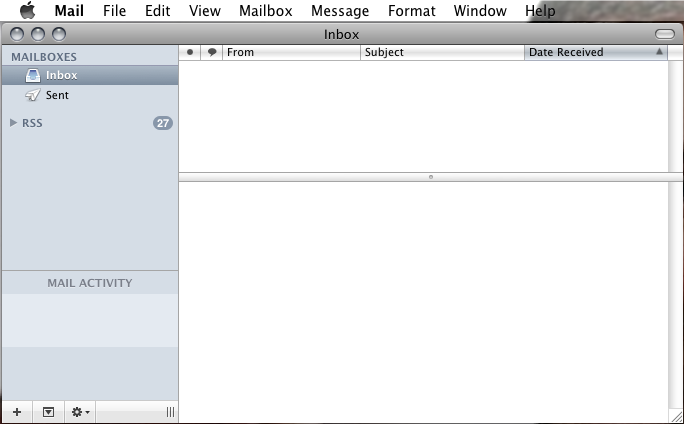 There are two tutorials for my email program. 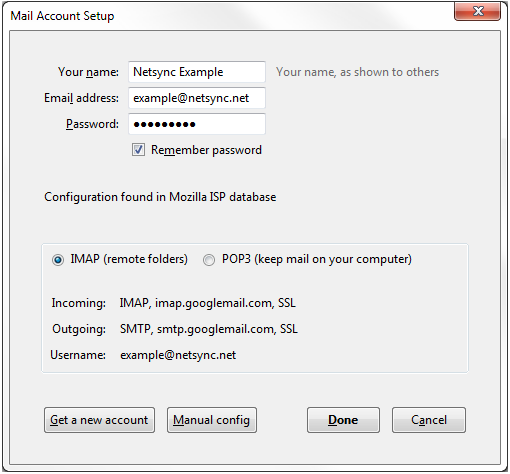 Which should I use, POP3 or IMAP? Which one you use will depend entirely on where you want your mail to be stored. 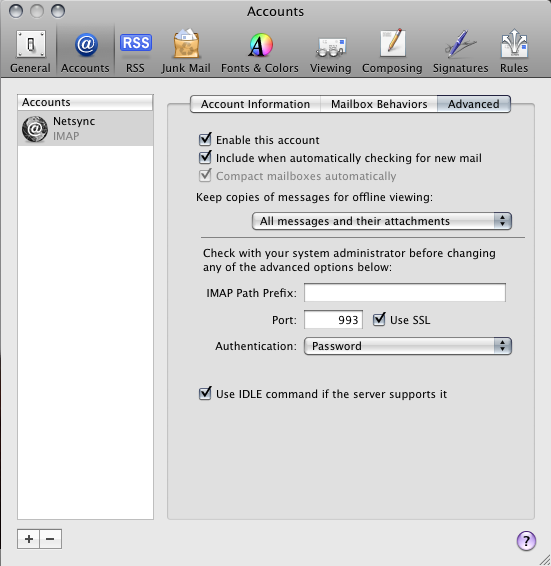 POP3 and IMAP are two different methods of retrieving e-mail. 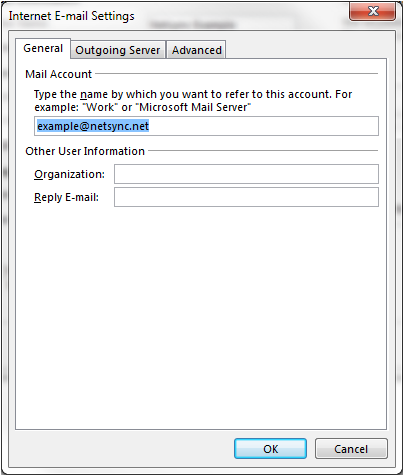 With POP3, your e-mail program takes messages off of the mail server and stores them locally on your computer. All of the messages you have downloaded will be available, even when offline. The downside to this is that, once downloaded, the messages are only available from that computer and cannot be viewed elsewhere. 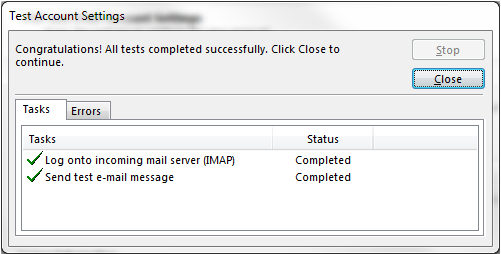 With IMAP, your e-mail program leaves the messages on the server, only downloading the messages you tell it to. 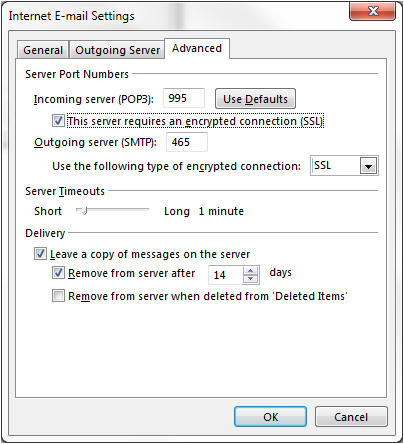 The messages stay on the server, and only a copy of what you have downloaded will remain on the local PC for viewing offline. This translates to better performance on slower connections. 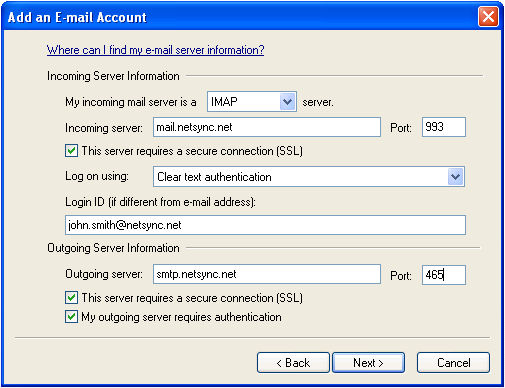 Your total mail storage, however, is limited to the amount of available mailbox space on the server. This has the advantage of working well with multiple computers, but has the disadvantage of storage limitations and limited offline access. 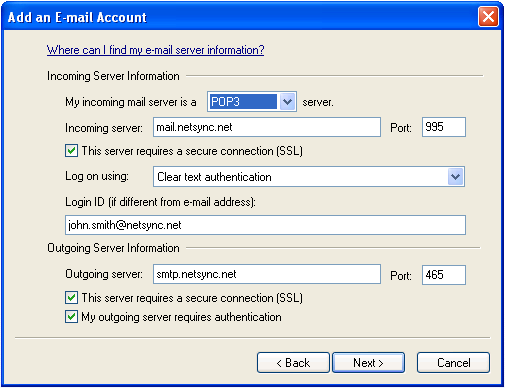 The majority of email users utilize POP3 for its straightforward setup and operation. 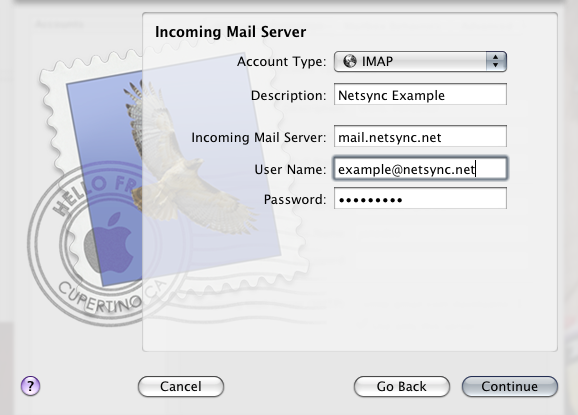 However, if you need to check e-mail from multiple locations or devices, then IMAP is a good way to go. Choose whichever option works best for you. 2. Click on Add e-mail account. 3. 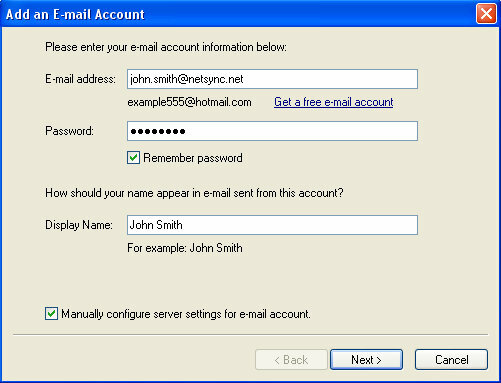 Enter your e-mail address into the E-mail address field, then enter your password into the Password field. Next, enter your name into the Display Name field. 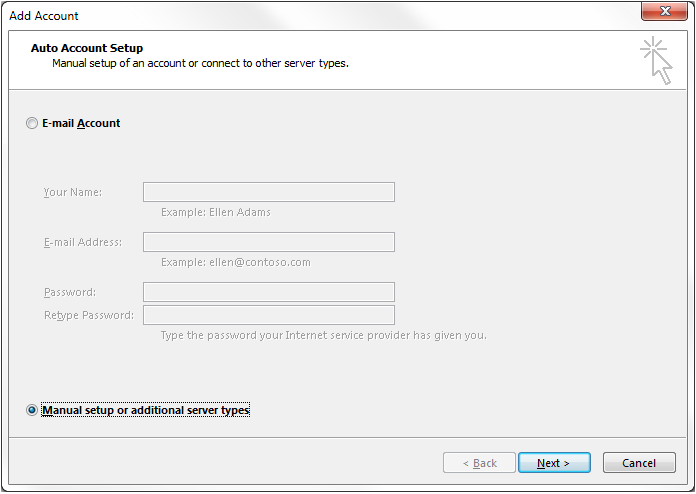 Place a check mark inside the check box labeled Manually configure server settings for e-mail account. Then click Next. 4. 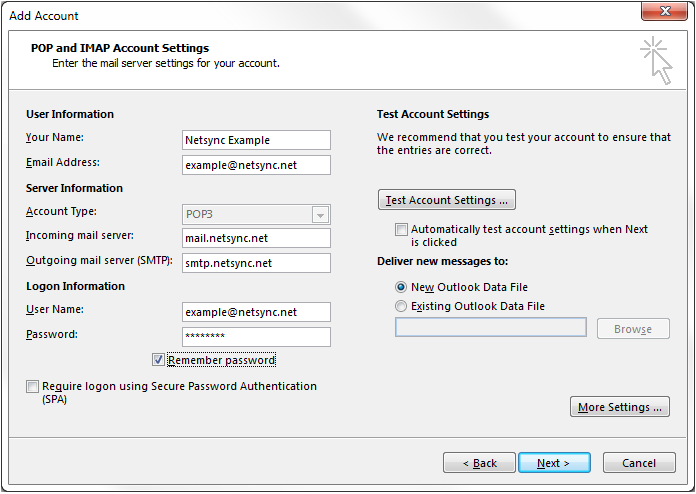 Please enter all information exactly as you see it in the image below with the exception of the Login ID field. 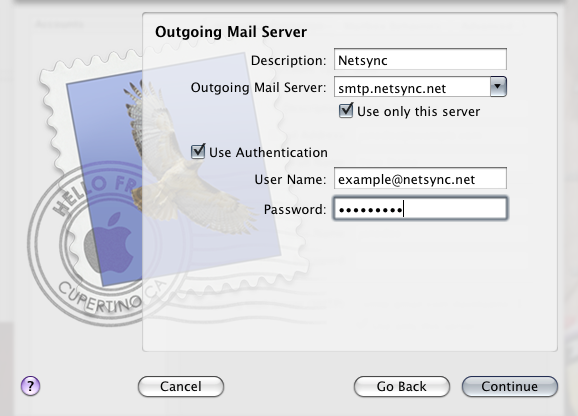 Please enter your e-mail address into the Login ID field. Then click Next. 5. 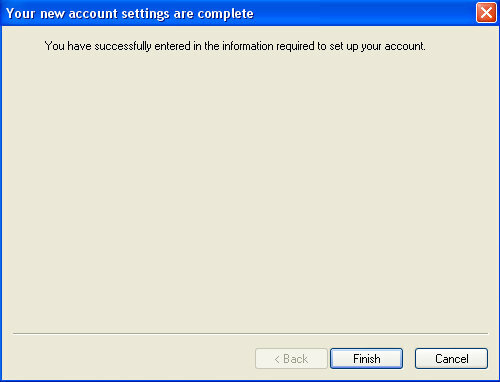 You will be greeted with a summary page that tells you you’ve entered everything you need to setup the account. Click on the Finish button. 1. 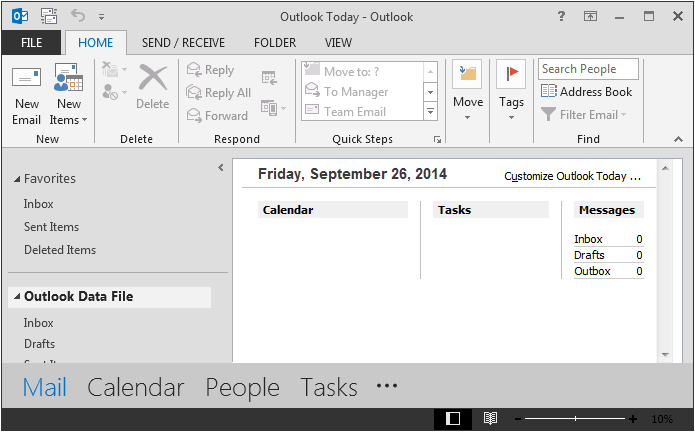 Open Outlook 2013. Then click on the File tab. 2. Click on the Add Account button. 3. 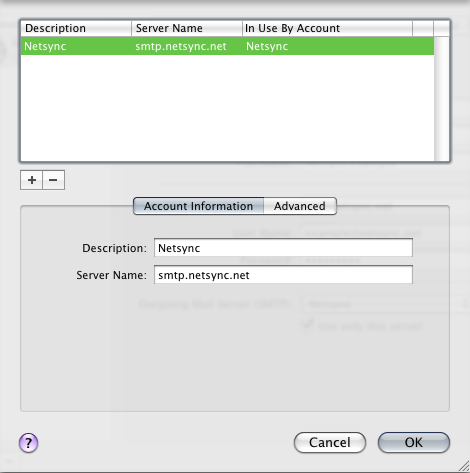 Click on Manual setup or additional server types. Then click Next. 4. 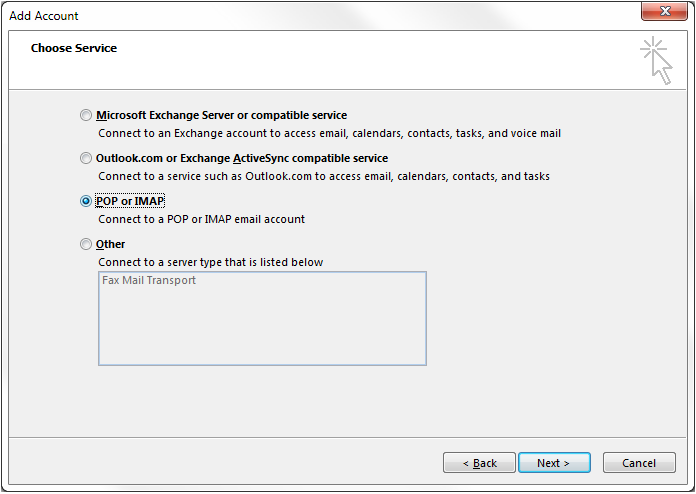 Click on POP or IMAP. Then click Next. 5. Please enter the information exactly as how it appears in the image below with the exceptions of your name and e-mail address in which you’ll want to use your own name and e-mail address. Then click on the More Settings button. 6. Click on the Outgoing Server tab. 7. 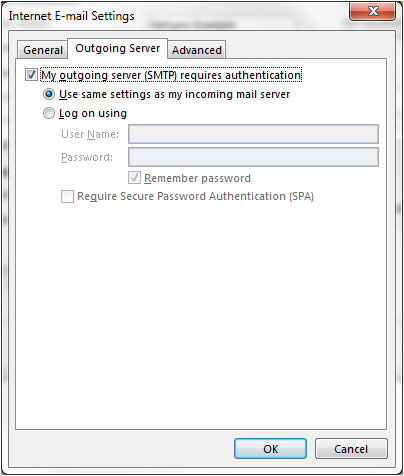 Place a check mark in the box for My outgoing server (SMTP) requires authentication. Then click the Advanced tab. 8. Please enter the information exactly as it appears in the image below. Then click OK.
10. 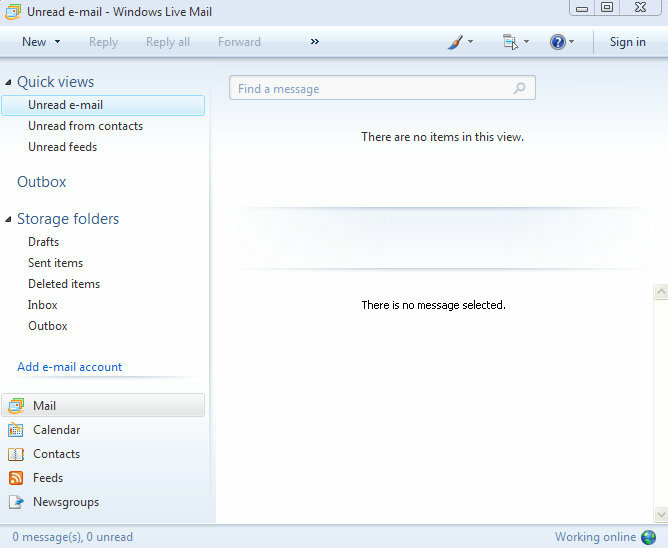 Wait for Outlook to test the mail settings, and you should see a window that matches the image below. Then click Close. 2. Click on the Menu button on the right side of the window, then hover your mouse over Options, and finally click on Account Settings. 3. 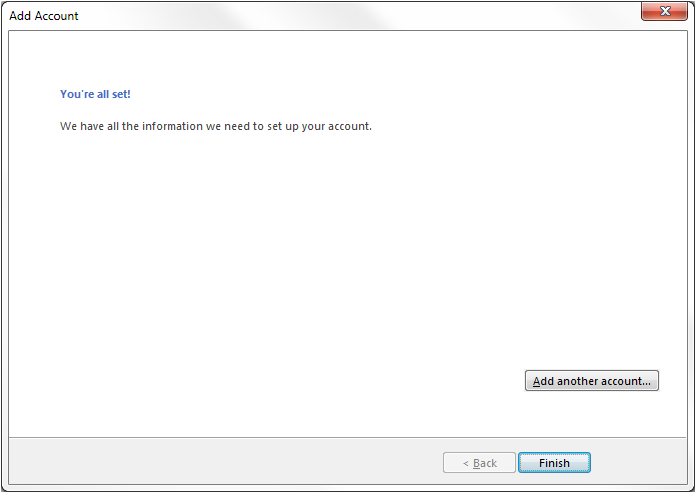 The Account Settings window will appear and will look like the image below. 4. 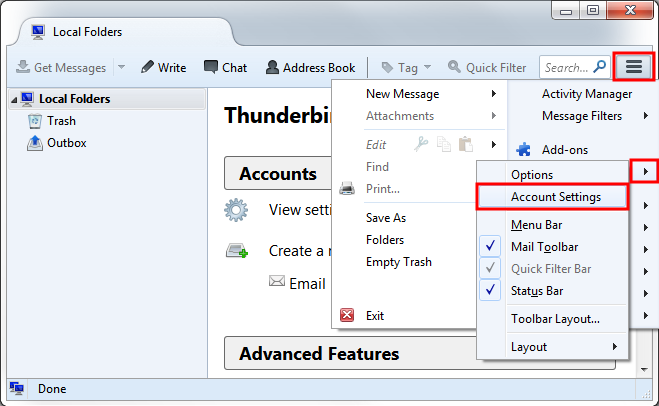 Click the Account Actions button, and then click Add Mail Account. 5. 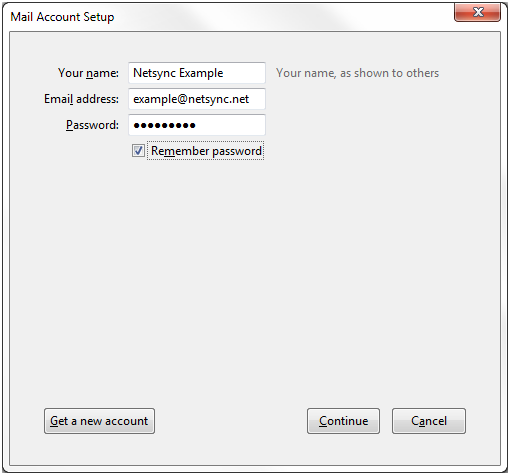 Enter your name, your e-mail address, and your password into the fields below. Then click the Continue button. 6. 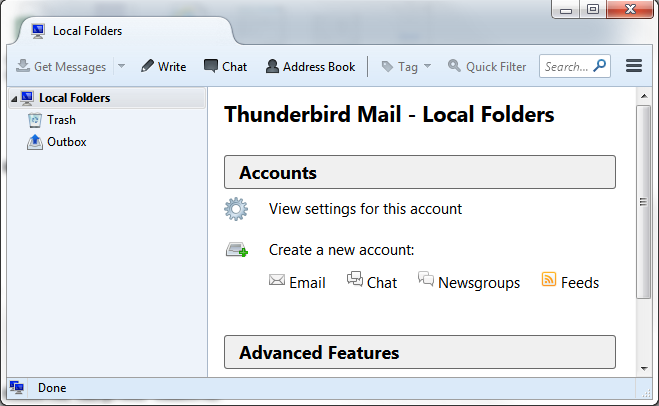 Thunderbird will try to auto-detect the correct e-mail settings for you and show you the results on the screen. The settings that it finds are not correct. So, we will need to change them to the correct settings by clicking on the Manual config button. 7. 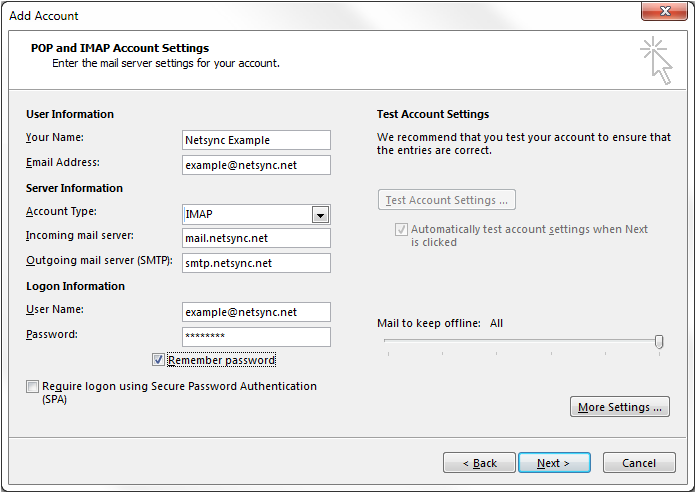 Enter all the settings exactly how you see them in the image below, with the exception that anywhere you see example@netsync.net, please replace that with your own Netsync e-mail address. Then click the Done button. If the Done button is grayed out and you cannot click on it, double check and make sure that both of the drop-down boxes under Authentication both say Normal password, then try clicking the Done button again. 2. 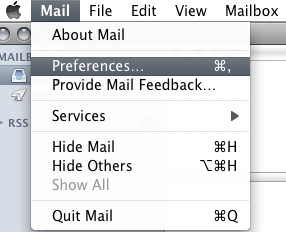 Click on the Mail menu, then click Preferences. 3. 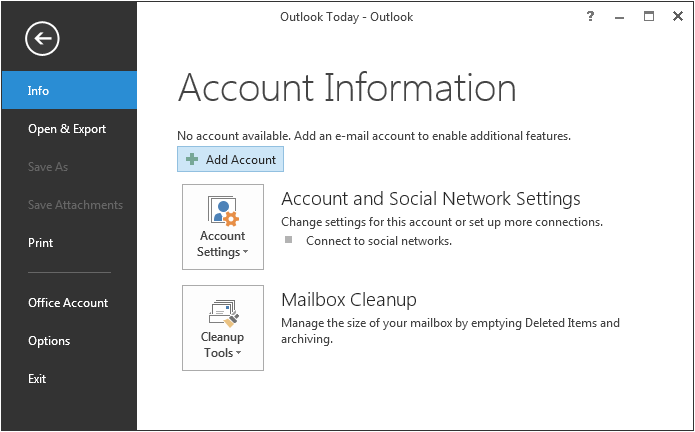 The Accounts window will appear. Click on the + (plus) button at the bottom left hand side of the window. 4. 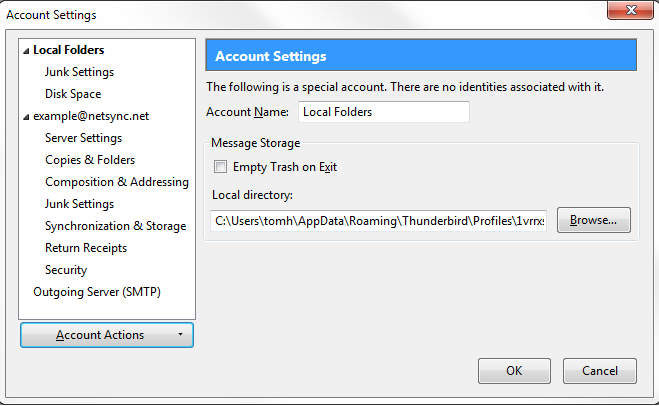 The Add Account window will appear. Enter your name, e-mail address, and password. Then click Continue. 5. 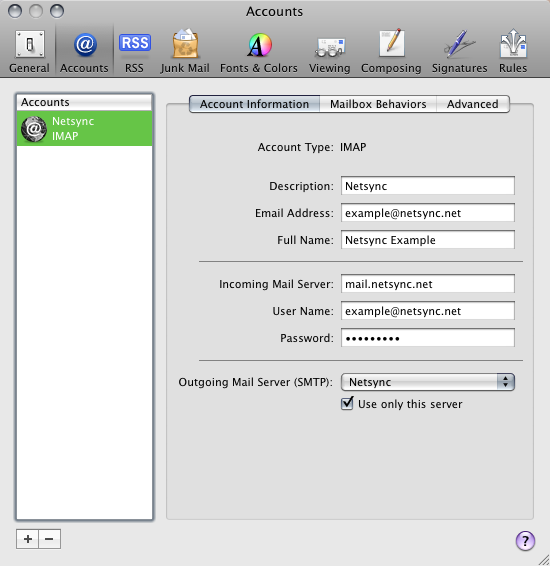 Under Account Type: choose IMAP from the list, and for the Incoming Mail Server: field, enter mail.netsync.net just like the image below. Then click Continue. 6. Enter all the information exactly as it appears in the window below with the exception of the User Name: field. 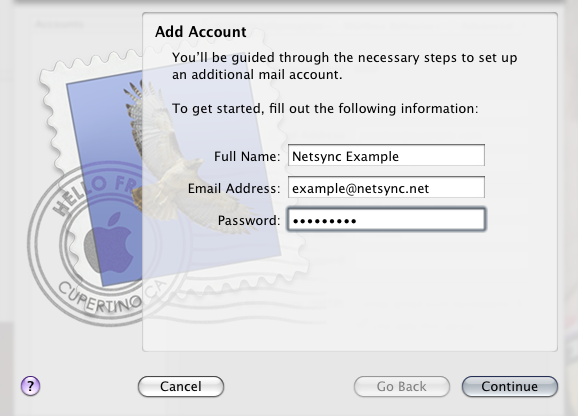 Please enter your Netsync e-mail address instead. 7. Place a check mark under Take account online, then click Create. 8. You will be returned to the Accounts window. 9. 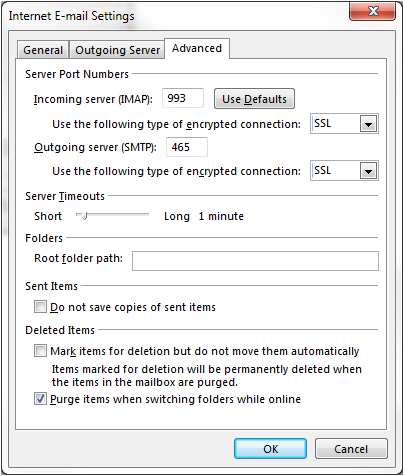 Under Outgoing Mail Server (SMTP): click on the drop-down box, then click on Edit Server List. 10. 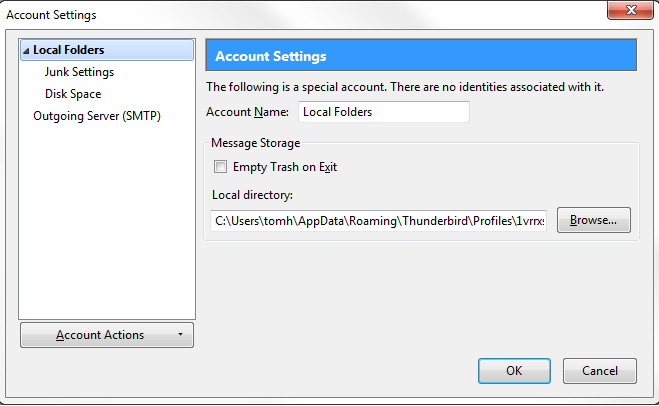 Under Account Information, enter the settings exactly as they appear in the image below. Then click Advanced. 11. Enter all the information exactly as it appears in the window below with the exception of the User Name: field. 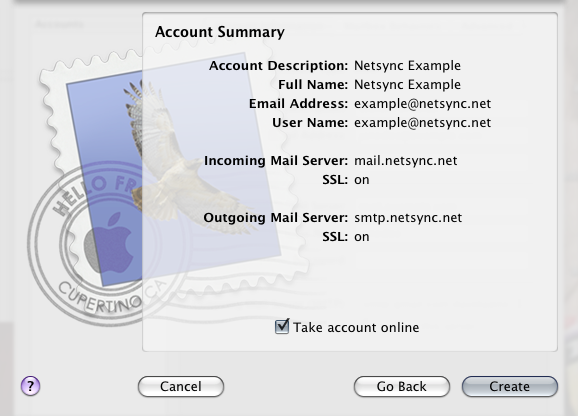 Please enter your Netsync e-mail address instead. Then click OK.
12. You’ll be returned to the accounts window. Click Advanced. 13. Enter all the information exactly as it appears in the image below. Then click the close button in the upper left corner of the window. You may be asked if you want to save the changes. If you are asked, then save the changes. This guide is here to give you some basic ideas to help protect yourself online. This guide is not meant to be comprehensive by any means as security issues change rapidly in the computer world, and all of the already existing security issues cannot be covered in a single document. It is meant to provide basic guidelines to help users keep themselves and their computers safe in common situations where users’ security could be compromised. We hope you find this information useful and helpful to improving your experience while online. Using this guide does not guarantee that your computer will not get infected with malware, nor does it guarantee that your identity will not be stolen. It becomes more and more important as each day passes to have a good anti-virus program running on your computer. It’s one of the easiest and fastest things that a user can do to help prevent their computer from being compromised by viruses, trojan horses, worms, and all the other types of infections crawling around the Internet. Also with the addition of a lot of legitimate free anti-virus programs available, cost is less of an issue in making the decision to put anti-virus software on the computer. There’s a lot of programs out there to choose from, and making a decision on which one to use is not always easy. Below, we have made recommendations for a free anti-virus program, and a paid one. We currently like these two programs the best, and find that they do the best job of protecting a computer from infection, not harassing the user, and have the least impact on the performance of the computer. Windows Update is crucial part of keeping your system up to date, and to minimize the risks of your computer being vulnerable to infection. If you don’t have automatic updates turned on in Windows then we would recommend that you turn it on, or setup a schedule where you manually check for updates once every month. Using a web browser that’s out of date can be just as dangerous as not keeping your anti-virus, or Windows Updates up to date. Use a modern web browser that has the latest updates and security fixes to reduce the risk of your web browser being compromised by an infection. While surfing the Internet, one of the easiest ways for your computer to get infected with malware are by the advertisements nested in most webpages. We would recommend that you use an Ad Blocker to prevent the ads from being loaded, which reduces the risk of getting an infection from one. It also has the side affect of improving the appearance of many pages that are plastered with ads. 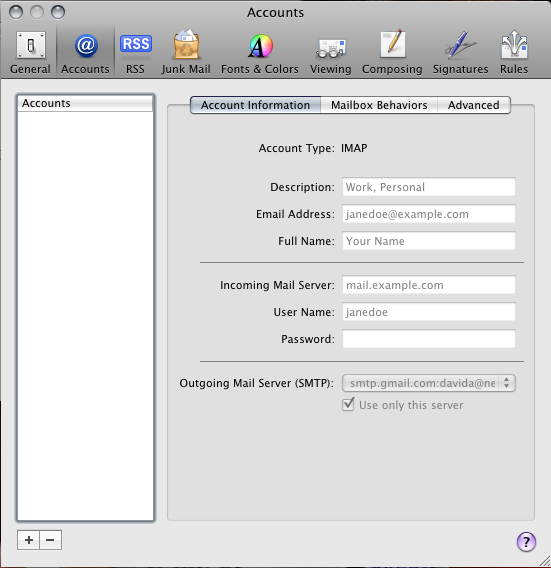 Many malware infections are spread via e-mail attachments. As a general rule, don’t open an attachment regardless of who sent it to you. You can just as easily get a malicious e-mail from someone you know as you could a total stranger. Now clearly attachments are very useful for getting files from one individual to another, and never opening an e-mail attachment ever would be just as silly never riding a bicycle because there’s a risk that you could fall off. We recommend that if you get an e-mail with an attachment, that you use some means to verify that the attachment is legitimate. You have a meeting with a co-worker, and he tells you that he is going to e-mail you a copy of the next year’s budget. 20 minutes later you receive an e-mail from that individual with an excel spreadsheet attachment and the attachment is called New_Budget.xls. Clearly you can open this attachment because the co-worker verified that he was going to send you an e-mail with budget information. A family friend sends you an e-mail with the subject “Look how ridiculous you look in this video”, and it has an attachment that’s called crazy_party.wmv.exe. Regardless of whether you went to a crazy party recently or not, you don’t want to open this attachment. Instead, contact the family friend first. Have them verify that they sent you an e-mail with a video. More often than not, you will find that your family friend did not send you a video, and that their computer is infected with a virus that is trying to spread to all their contacts. Additionally, the name of the file (crazy_party.wmv.exe) has .exe as the file extension. When .exe is at the end of a file, that file is a program, and not a video. So, if you receive an e-mail, and the file says .exe at the end of it, remember that file is a program, and not a video, or picture, or document. If you feel you need to see the contents of an attachment and cannot verify it with the sender, then don’t open the attachment. Instead, save the attachment to your desktop, and then scan the attachment with your anti-virus program. If your anti-virus program says it’s clean, then you are most likely safe to open the attachment. Make sure that you’re at the site you think you’re at. If you’re suspicious that you are at a malicious website, shopping online, checking web based e-mail, or doing online banking, then check your address bar and make sure that you’re at the website you think you’re at. Often times malicious websites will attempt to look like legitimate websites, and many times they look pretty convincing, but if you check the address bar you can usually see whether the site is legitimate or not. You’ll notice that at the beginning of the address, it shows http://www.amazon.com/ This is an indicator that you are at the Amazon website because amazon.com appears as the actual .com address that you have visited. You’ll notice in this address that http://www.amazon.xdealsx.com/ appears at the beginning of the address. In this case, you are not actually at amazon.com. Instead you are at xdealsx.com which is not amazon.com, and in this example xdealsx.com would be a malicious website trying to hijack your amazon.com account. As a note, xdealsx.com is not a real website as of this writing. We only used that name as an example of what a malicious link in your address bar could look like. So, if you’re doing any business online, please check your address bar as a way to verify that you’re at the site that you believe you should be at. It’s one more way that you can reduce the risk of an infection, or identity theft.